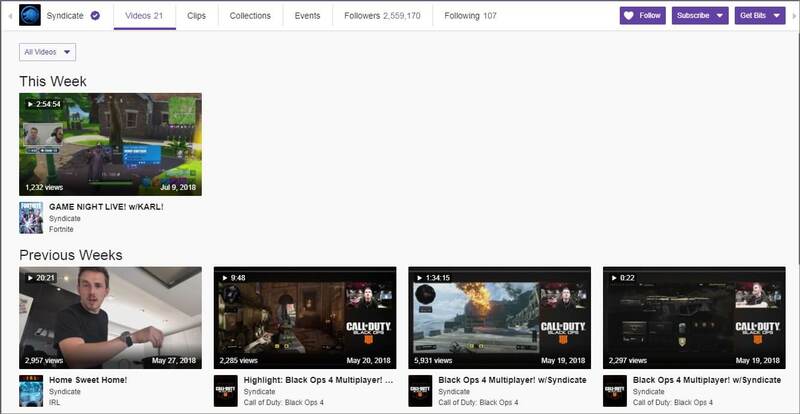 Twitch is well known as a top-rated live streaming platform with a primary focus on video gaming. This online streaming platform also provides coverage of eSports tournaments from time to time. As per a recent survey conducted in the USA in February 2014, Twitch was rated as a fourth largest source for the peak internet traffic. This user count reached 2 million broadcasters per month in the February month of the year 2018; with around 15 million active users per day. However, among all these broadcasters, it is difficult to decide the top influencer. By collecting data from online sources, we have listed some of the best organizations and people on Twitch who are successful in managing the highest number of followers on Twitch. Most of these Twitch channels either focus on the live streaming of certain gaming tournaments or shares the host game playing sessions. Summit1g channel is controlled by Jaryd Lazar who keep on streaming Counter-Strike: Global Offensive along with Fortnite. Streaming is his full-time job, and he keeps on broadcasting every day except on Thursdays. He is also known as an ex-competitive player of Counter-Strike who used to play for Team Mythic and A51. But now he has turned into a full-time streamer and loves to spend most of the time on shooter games. This 27-year-old gamer belongs to Colorado, USA and he gained huge popularity on Twitch platform by January 2018. Tom Cassell is known as Syndicate, and this name is popular on Twitch as well as on YouTube. He owns a third most popular channel on Twitch, and TheSyndicateProject channel is one among top 100 subscribed channels on YouTube. Tom Cassell is a record maker for being the first person on Twitch to receive more than 1 million followers. He prefers to play Minecraft, Tom Clancy’s The Division, Counter-Strike: Global Offensive, Call of Duty: Black Ops III. Tom also has his own merchandise website that is popular as Syndicate Original. Michael Grzesiek is popular as one of the best players to watch in action with awesome entertaining skills. This top-tier professional keeps on playing Counter-Strike for Cloud 9. Some of his most played games are Tom Clancy’s Rainbow Six, Counter-Strike: Global Offensive, The Culling, Tom Clancy’s The Division, H1Z1, and PUBG. He is known for playing CS:GO for the ESEA Invite League with the popular Cloud9 G2A. Ge prefers to live stream his games whenever he sits to play them, and in most cases, he shares around 50 hours a week on Twitch channel. The average viewer’s count on his streams used to be 25,000 viewers; however, for the special tournaments, he often receives around 7 million viewers. ESL represents an Electronic Sports Company, and ESL_CSGO channel is popular for routine broadcasts of Counter-Strike: Global Offensive games and various tournaments. These professionals prefer to stream continuously; either the live stream games or rerunning games; hence, this platform is popular as industry’s first Counter-Strike Twitch channel that ensures 24x7 hours of live streaming. You will be happy to know that they also have commentators that always keep on describing the action on the screen; it seems like you are watching traditional sports. They also post pre-match and post-match interviews with various tournament gamers. You will find channel page always loaded with various advertisements related to clothing, gaming equipment and even computer hosting as well. LIRIK, popularly known as Bean Bandit is a popular PC gamer and Twitch Streamer whose presence is recognized on various social media platforms along with his Twitch channel since the year 2011. LIRIK started streaming after one year of DayZ release, and he plays a variety of games like Fortnite, PLAYERUNKNOWN’s BATTLEGROUNDS, Arma 3, and H1Z1, etc. He is always careful about maintaining his privacy online and rarely use his real name on the network. Tyler “Ninja” Blevins spends five days per week on Twitch streaming, and he also interacts with his viewers during gameplay. He is popular for playing Luminosity Gaming and also broadcasts the H1Z1 playing hours whenever he finds an opportunity. He is currently focused on Fortnite but also spares time to play League of Legends. Ninja spends around 80 hours per week for playing and streaming his top games. During the Halo World Championship for Halo 5, ‘Renegades’, Ninja’s team reached 5th-8th position. DrDisRespect is popular as the Face of Twitch for receiving multiple awards in the year 2017 and is also an online self-described superstar in the world of international video games. After being offline so long, he recently managed a record of capturing 388,000 viewers for his return stream. Note that, he took a break from Twitch platform on Dec. 14, 2017, to focus on his family. His supporters are allowed to join Champions Club, and they can receive 50 exclusive emoticons along with subscriber badge for the chat. Rabia Yazbek, a 23-year-old from Michigan, USA is popular in the online gaming world with his channel Nightblue3. He is playing the League of Legends from past 7 years, and during Season 3, he was Rank 3 Challenger from North America and Rank 6 Challenger during Season 4 at Europe. He also maintained this position for Season 5-7. Nightblue3 is more popular for his in-depth guides, highlights, patch note reviews, gameplay montages and spectates. He considers his Twitch channel as a place to discuss various gameplay tips, theorycraft and advice while enjoying fun hours on games. Imaqtpie is a 25 years old Florida based streamer who is known as Michael Santana in the offline world. He prefers to stream during night hours and is popular as a full-time League of Legends player. In this game, he is famous as Challenger 1 on the server of North America. However, his current championship is known for flipper360 LAN tournament. Up to the end of the year 2014, he was a member of professional gaming team Dignitas. Imaqtpie spends around 9 hours for live streaming every day and enjoys it for 6 days a week. He also joins Scarra to host a weekly segment named as “Beyond the Rift” where he discusses top issues, news and various predictions about popular games. Riot Games is a popular eSports organizer and American video games company that makes use of this Twitch channel to live stream various eSports championships. They mainly focus on European and North American League of Legends championship series. Riot Games was actually founded by Marc “Tryndamere” Merrill and Brandon “Ryze” Beck in the year 2016. They currently operate their League of Legends service throughout the world along with the localized version of this game. If you are a crazy gamer and love to watch seasons online, it is definitely good to follow these legends on the Twitch platform. You will learn several game playing tips and tricks from these professionals, and soon you will be able to beat your competitors on top games online.